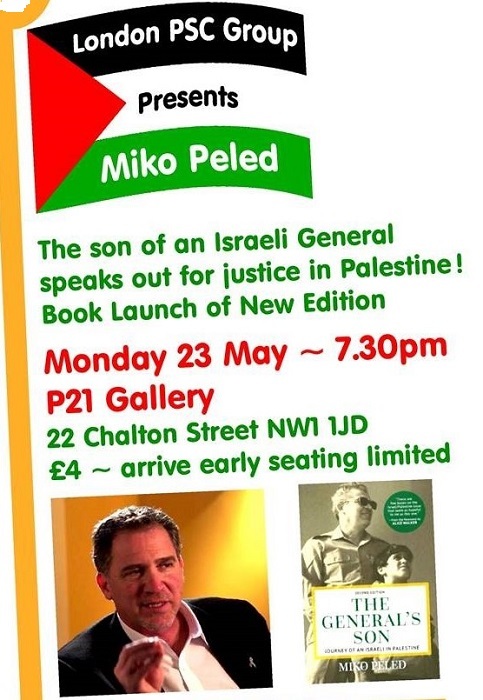 Miko Peled is a Jewish Israeli peace activist. His grandfather was a Zionist leader and signatory on the Israeli Declaration of Independence. His father, Matti Peled was a young officer in the war of 1948 and a general in the war of 1967. Miko Peled followed his father’s footsteps at first, joining Israel’s Special Forces and earning the red beret, but he soon grew to regret his decision. He surrendered his status as soon as he had earned it, becoming a medic, and finally, disgusted by the 1982 Lebanon invasion, buried his service pin. In 1997 Miko lost his beloved Smadar, 13, the daughter of Miko’s sister Nurit and her husband Rami Elhanan to a suicide bomber in Jersualem. This tragic event propelled him on a painful journey of discovery to understand the Israel – Palestine conflict that had dominated so much of his and his family’s lives. There will be a minimum entrance fee of £4 per person, but we hope you will be able to give more to help us cover the costs of staging this important event. Please arrive early to secure a seat.